Cacao was once so revered by the Mayans and the Aztecs that it was used as currency. Flavored with chilies, vanilla, cinnamon, nutmeg and other spices, the beans were traditionally ground into a paste to make delicious chocolate dishes and ceremonial drinks. A true superfood, cacao powder is a source of Magnesium, Iron and Zinc and Fiber. Cacao also contains essential minerals and a host of antioxidants giving it an ORAC value of 11,000 per 1 heaping tablespoon 20 gram serving. While most Cacao nibs are roasted, Organic Traditions Cacao nibs are raw with no added flavors or additives. The nibs are then pressed into a paste and the Cacao’s fat content is removed, yielding delicious Cacao powder. 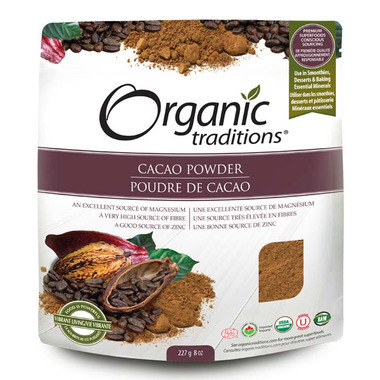 While many other cacao powders have added sugar, Organic Traditions is pure, rich cacao powder in its natural state with no added flavorings or sweeteners. Great product to make a healthy chocolate banana smoothie.